We are offering UPVC Threaded Pipeto our clients. We provide high-quality products to our clients. Established in the year 2012, we, “Ocean Pipes & Fittings”, have registered ourselves amidst the prominent firms which are engaged in manufacturing and supplying a wide range of PVC Pipe, PVC Plumbing Pipe and PVC Pipe Fitting. Our product range includes Industrial PVC Pipe, PVC Pipe, Conduit Pipe, Industrial Pipe, Plumbing Pipe and UPVC Pipe. 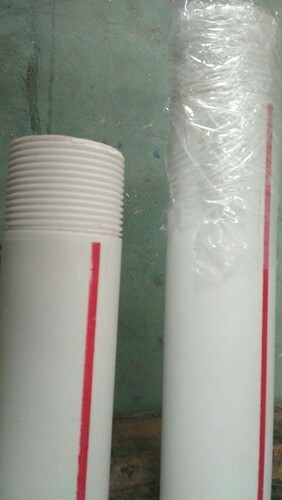 In addition to this, we are providing Industrial PVC Pipe and various PVC Pipe Fitting such as Plain Pipe, SWR Pipe, Casing Pipe, Agriculture Pipe, Pipe Fitting, PVC Fitting and PVC Pipe Fitting. All these products are manufactured in accordance with the ever changing markets demands. We used superior-grade raw material for manufacturing the offered products. Our professionals are well-trained and implemented sophisticated technologies to design the offered products. Therefore, offered products are highly suitable for wide applications in water supply pipes, irrigation, agriculture, telecommunication cable ducting, disposal of chemical effluent & waste, acid slurries transportation and various other industrial applications. Owing to their high tensile strength, low maintenance, excellent resistance to corrosion, abrasion, chemical, water, leakage, pressure and temperature, prolonged service life, sturdy construction and customized designs, these products are applauded by the patrons.